Danby is one of the largest household appliance marketing companies in North America, with an impressive lineup of compact, specialty and home comfort appliances to suit the lifestyles of today's consumer. Available at AJ Madison. Their History... Danby was founded in Montreal, Quebec, Canada in 1947, as a manufacturer of small electrical appliances and compact refrigerators. In 1981, Danby was re-located to Guelph, Ontario. 2007 marks Danby's 60th year in the business of providing quality products to the North American market and thanks to their customers, business keeps getting better. Their Products... Danby's reputation as a leader in the appliance market has been achieved by researching what consumers want and providing quality innovative products at competitive prices to fit their lifestyles. Their products are marketed under four brands: Danby, Diplomat, Silhouette and Simplicity. Their Goal... Danby's commitment is to provide exceptional quality and value with a continued dedication for creating innovative, unique products that are designed to fit your lifestyle. 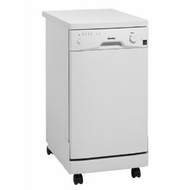 This Danby Designer 8 place setting dishwasher is a convenient and efficient addition to any home. At 18 wide this model takes up minimum space and the built-in castors allow it to be easily moved. Energy star rated and boasting a low-water consumption feature, this model is eco-friendly. Suitable for not only condos and apartment this model even offers a built in soft water system for remote cottage locations.